General Plastics Manufacturing Company plays a pivotal role in allowing individuals whose faces are severely burned to live a more normal life. Its LAST-A-FOAM® FR-4540 tooling board material is used by CimMed, Inc. of Algona, Wash. to manufacture state-of-the-art compression therapy masks that optimize the healing of burn patients while saving hospitals precious time and resources. CimMed demonstrated its innovative process and foam-based tools for making masks last week at the American Burn Association’s annual conference, which drew 3,000 burn care professionals from around the globe. Right after skin-graft surgery, the burn patient’s face is scanned without being touched using CimMed’s handheld laser wand. The scan data is used to create a 3-D image of the patient’s face, which is shared with the burn team. In a live online meeting, the occupational therapist directs additional changes so that the finished mask puts pressure on specific areas of the face. This keeps swelling down, and removes or prevents scarring. After making those adjustments, CimMed releases the approved CAD file for manufacturing and the mold is machined on a CNC mill using General Plastics’ top-end LAST-A-FOAM® 40-pound tooling board material. The machined tool is placed into a vacuum-forming unit to create the burn mask, made from silicon gel, then trimmed out to fit the patient for therapy. It takes less than three hours from scanning of the patient’s face to overnight shipment of the finished compression mask to the hospital – a process that would otherwise take a burn center’s staff three days – or weeks, without access to the technology. 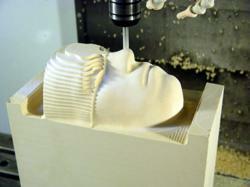 CimMed’s choice of tooling board material directly impacts the end result. “In our CNC machining, we must work very quickly – but without creating any gullies or valleys that can create a texture that is pushed into the patient’s face,” explains Steve Kidd, CimMed president. Kidd also cites the fact that it’s non-abrasive, which protects their CNC machines. “The material breaks off into shavings, providing a dust-free tool ready for vacuum-forming, which also makes it very easy to clean the mill after machining,” Kidd says. Burn therapy masks are just one example of how General Plastics’ high-density polyurethane foam makes a difference in the medical and life science fields. LAST-A-FOAM® products are also used for medical imaging tables, beds for CT scanners, and diagnostic equipment, because the material is sturdy and stiff, but transparent to X-rays. Product lines structured to mimic human bone densities are regularly used in orthopedics as artificial media for bone testing, such as by medical students and for research. They also provide a core material for manufacturing composite prostheses and other reconstructive applications. Tacoma, Washington-based General Plastics has been a leading innovator in the plastics industry for more than 70 years. The company develops and manufactures rigid and flexible polyurethane foam products, which include its signature LAST-A-FOAM® brand series and build-to-print composite parts. Through its network of distributors, General Plastics exports products to 25-plus countries for the aerospace and defense, nuclear containment, composite core, prototype and modeling, construction, dimensional signage, testing, marine and renewable energy industries. General Plastics is certified to ISO 9001:2008/AS9100C and meets such demanding quality systems as NQA-1, Mil-I-45208A and Boeing Company D6-824. Visit http://www.generalplastics.com. Established in 2007, Algona, Wash.-based CimMed is a private company that provides sales, service and training to medical professionals in hospitals and burn centers. Its products are used for the creation of compression masks used in burn scar management, and in the creation of custom-fit compression garments. Visit http://www.CimMed.com.